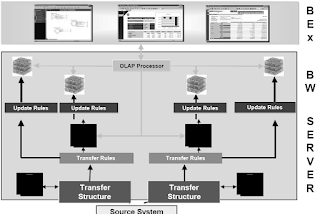 SAP BW Operational Data Store is needed in the following business scenario. You often want to combine the information contained in several DataSources before you store the data in InfoCubes. Some analyses also need to access data that is more detailed than the data stored in the InfoCube. The ODS must make this detailed data available to the query. It is your job to evaluate the ODS functions and find out if they meet these requirements. It is not possible to overwrite data in the InfoCube. Any data that is added to the InfoCube is aggregated (summarized). This is required by the architecture of the InfoCube. You are, however, able to overwrite data in the ODS. This expands the range of options available in BW.Somewhere is needed for the data to be consolidated and cleansed. This is important when data is uploaded from completely different source systems. After data has been consolidated and cleansed, it can be uploaded into the InfoCubes. Before the ODS was introduced into BW, the data in the InfoCube was the only factor that determined the level of detail (granularity) of the data. Today, the InfoCube can be less granular, because data can be stored over a longer period of time. In contrast, the ODS has a high level of granularity, but it stores data for shorter periods of time.You report on ODS data in a variety of ways. The PSA allows you to use transfer rules to upload data into the BW ODS (Operational Data Store). In the graphic, the ODS is displayed as a single level. 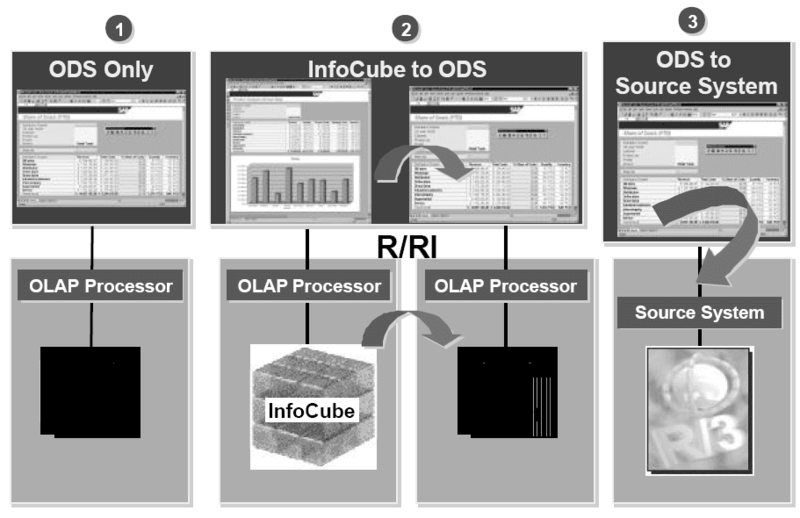 Depending on the business scenario, the BW ODS can also take the form of a structure consisting of several levels.The ODS objects in the inbound level of the BW ODS provide subject-oriented, consolidated, and integrated data that refers to a process that is common to different source systems.Data from the ODS is updated in the appropriate InfoCubes or in other ODS objects.ODS reporting takes place using the OLAP processor or directly using an ODS query. 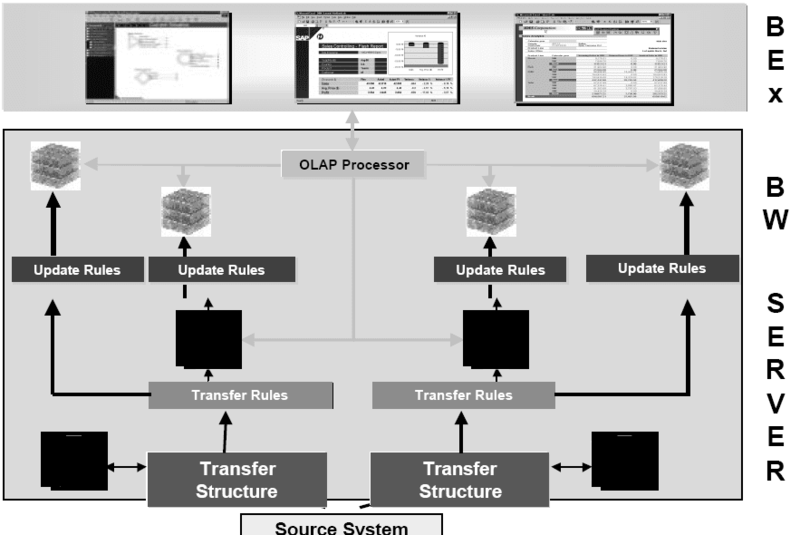 When data is transferred from the PSA into the ODS, transfer rules cleanse the data records and standardize them so that they are valid as characteristic values throughout the company. If it is appropriate to do so at this stage, business logic, in the form of update rules, is also applied. Data from several InfoSources is consolidated into an ODS object. For example, you might want to combine the data from the Order InfoSource, the Delivery InfoSource, and the Billing InfoSource and use it to report on the status of orders. Once the data has been saved or during the update of the data in the ODS, you have the option of making technical changes and changes to the data itself. In the ODS, the data is stored in a denormalized data structure. Key fields and non-key fields are determined by the customer. The ODS is made up of consolidated data from several InfoSources on a detailed (document) level, which means it supports the analysis of documents. You run this analysis either on the contents of the ODS table directly, or using an InfoCube query to create an ODS request in the form of a drilldown. 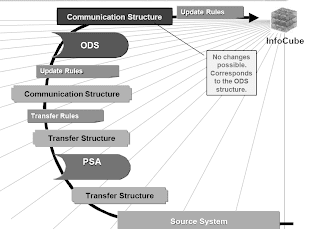 In the context of the ODS, the PSA is the first level of the ODS and the ODS table is the second level of the ODS. The first level, therefore, consists of transaction data from the source system, and the second level consists of consolidated data and the data from several source systems and InfoSources. 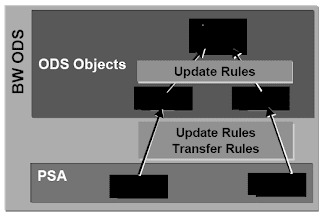 An ODS object consists of three tables. When data is uploaded from the PSA it is stored in the table that is shown below as Modified and New Data . The data is activated from this table - once data is active you are able to use it for reporting. The other two tables are called the Active Data table and the Change Log table. Active data is used in reporting. The change log is used to update InfoCubes or additional ODS objects, or as a data mart for the PSA to different BW systems. Delta updates are supported: ODS - ODS Within the same system: Export-InfoSource generated automatically. ODS - InfoCube Within the same system: Export-InfoSource generated automatically. ODS - PSA Different systems: Export-InfoSource must be generated manually. 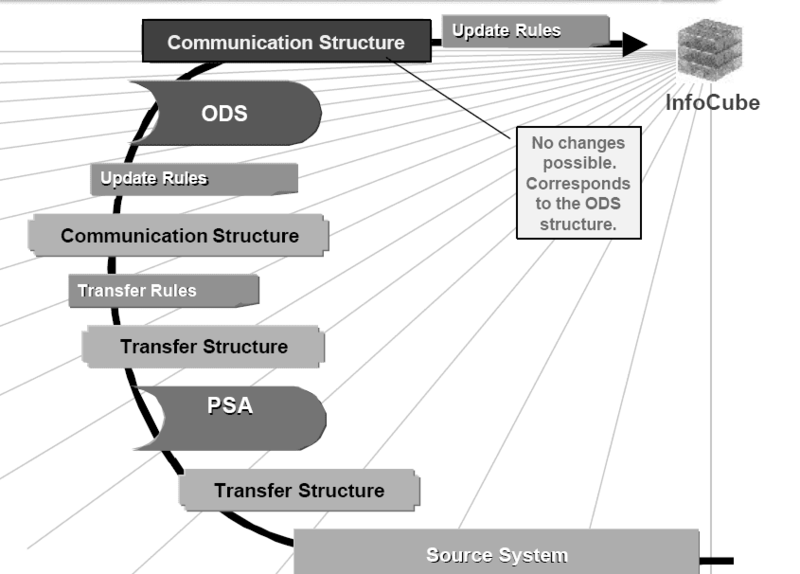 The following graphic shows all of the components that are involved in the flow of data from a source system,through the BW ODS, and finally into the InfoCube.Note that the communication structure that is linked to the InfoCube by a series of update rules cannot be changed, since it is simply a representation of the object structure in the BW ODS.The first step in processing data from the ODS into the InfoCube is to select the Generate Export- DataSource function for the ODS object. There are three possible scenarios for analyzing ODS data. In the first scenario, you use an ODS query to analyze the data in the ODS object directly. However, this is not usually the most efficient way to access the data. The second scenario involves the report/report interface (R/RI). 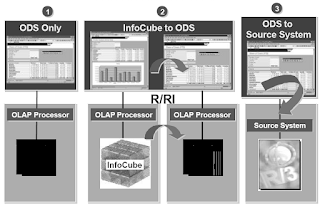 A query analyzes the data in an InfoCube and uses the R/RI to drill down to the ODS and access more detailed data. In the third scenario, you access the original documents directly, such as the original purchase order in the OLTP system. From the ODS you are able to access the source system directly and run an R/3 transaction or start an existing report.